This passage is an indictment against everything we think we know about religious evangelism. For that reason, it is one of my favorite passages in all the bible. It starts by setting the stage. The old covenant is broken. If it were not, there would be no need for a second one. After that bold declaration, the writer outlines a particular way in which the new covenant is different. Dispensational theology suggests we are living in the second dispensation, under the second covenant right now. The Lord’s return will mark the third. The first was ended at the cross. We also separate the books of the bible along these dispensational lines. We speak of the Old Testament and the New Testament. It is the pre-Jesus, post-Jesus era. The first covenant was with the Jews. The second is with the followers of Christ. My point being that almost all Christians would say that we are living under the new covenant right now. The writer is focused on the method of revelation. How do we receive God’s word. How do we know it is really him, and what he really wants from us. Acquiring that information is called revelation. Sharing it with someone else is called evangelism. The new covenant was to include a method of revelation that required no evangelism. According to the Lord, he would put his laws in our minds and inscribe them on our hearts. This is a great departure from the days when we were to do the writing and inscribing ourselves. There would be no more transcription errors, or interpretation errors, or transmission errors from one person to the next. From the least to the greatest, everyone would know the Lord. There would be no need for countryman or brethren to teach another about the Lord or his ways. There would be no more evangelism. Here we are firmly entrenched in the second covenant. Yet the neighborhood sidewalks are dotted with white-shirted pairs going from house to house teaching the good news of the god of Mormons and Jehovah Witnesses. Countrymen and brethren are still enlisting neighbors to attend the revival meeting that will introduce them to Jesus. Pamphleteers are still leaving small booklets about the Lord’s will for you on bus seats across the country. Pastors are desperate to offload some of the evangelistic burden onto their members. Evangelist campaigns range from door knocking to TV ads. One thing is for sure; even though done poorly, evangelism is alive and well. Apparently, there is still a need to press the flesh, establish fake relationships, and tell strangers how to get to know the Lord. What does this mean. First, it means that the second covenant has failed just as badly as the first. Maybe we disappointed God yet again. Maybe he pulled out of the second covenant. He decided not to write his precious laws on our hearts after all. Perhaps he decided that writing them in an indecipherable book was sufficient. Or perhaps the indecipherable book was our idea, so he took his ball and went home. What ever the case, the evidence for the second covenant has not materialized. We never got the second covenant, and there was no mention of a third. Second, our evangelistic efforts expose religion as a purely human enterprise. If you have to use the power of persuasion to sway me to your side, then it is you, and you alone who are doing the persuading, and it is wholly your cause. If you tell me about Jesus and I decline, that is not your failure, but God’s. If the message wasn’t compelling to me, then the message is at fault. God’s Spirit can work on my heart or not. It is his choice, and in his hands. If you persist, then you are insinuating yourself into the process. You are trying to persuade me for your purposes, not letting God’s word speak for itself. What if God selected me as a vessel of destruction? Who are you to try to persuade me to his cause? In this new covenant, God is supposed to communicate directly to me. How I respond to that is my business, not yours. No evangelism should be required if you really trusted God to do his business the way he sees fit. Christians may counter that with the commissioned to go and preach the good news to every nation. That is simply not true. He gave that very specialized message to twelve people who were specifically called and trained for the purpose. You are not the 13th apostle who replaced Judas. Jesus did not spend three years in Arabia grooming you to take over apostle duties for the gentiles. Apostles like Paul and Peter groomed assistants like Mark and Luke. But at no point did they prepare an apostolic line of succession. When the apostles died, so did the office, and the associated power that went with it. 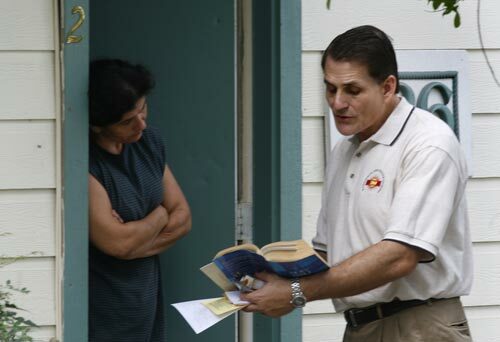 There is no chapter in the bible about how to evangelize your neighbor. There is no how-to guide for getting people to come to church with you, or telling people about Christ. This does not exist for the very excellent reason that the new covenant was supposed to have eliminated the need. God has not enlisted you to tell others about him. Believing you are called to do such a thing is arrogant dilution bordering on narcissism. Stop it! Just stop it! As a kid, I learned about my calling. I was special. I had talent, and I was meant to do something important with it. God had a mission for me. He had some necessary job I was supposed to do. All I had to do was pay attention and watch for the signs. Obviously, some type of evangelism was a part of that calling. It was only natural that I would go into the preaching business. God needed me, and I felt needed. I didn’t become a salvation salesman because of my secret love of rejection. I did it for Jesus. He needed me, and I felt needed. I approached strangers and friends alike. I brought them to revivals, set up home bible studies, and did the one on ones. I personally baptized a few, and brought others to the point of baptism. I was answering my calling. I was needed, and I felt needed. Today, I would not worship a god who needed someone like me for anything. I now realize I was working for my organization, not my god. We were concerned about lost members, not lost souls. This fact was brought home to me when I put in for a new position at a church I was attending. The powers that be really seemed to like the idea and were willing to pay me to do it. All I had to do was bring in a minimum of five new families as members. I could have done it. In the end, I refused to pursue it further. I couldn’t get past the dilemma a of evangelizing solely for the purpose of financial gain. For the first time I realized that evangelism was about lost revenue rather than lost souls. I never campaigned for Jesus after that. I no longer felt needed. I felt dirty. Listen. Put down the pamphlet, the flyer, and the filmstrip you were planning on showing. Do not knock on that door or ask your friend if they would like to get to know your god. They don’t. Their god, or lack thereof is quite sufficient. Growing up, I was taught to believe that many people would burn in hell for all eternity because I didn’t take every opportunistic opening to sell them on the gospel as I knew it. There is a quiet desperation in evangelism that is more like a cry for help. Consider this an intervention.